I’ve been doing a bit of self reflection recently (sounds a bit wanky but stick with me). If you’ve read previous blog posts of mine you’ll know I’ve found the last 18 months since having my daughter…challenging. I’ve still not figured out what the hell I’m doing (has anyone?!) and I’m constantly trying to get to some place where I feel settled and I don’t have to keep having a cry or feeling like I can’t do this. I’ve been spending so long on the bloody treadmill just trying to keep going that I’ve never thought to just turn down the speed. I’ve lost hold of myself in amongst the constant crazy of what my life is now. I might not be able to control everything, but currently I’m not controlling anything. There’s a girl I used to know, in that photo at the top. She knew what she wanted, she knew who she was, and she didn’t always get it right, but that was ok. She was friendly, helped people out, she’d worked hard to build a career and she loved her family and friends. She was fun! Then she had a baby and someone picked up the bucket of her life, tipped it upside down and walked away. In case you missed it, that girl is me. I feel like I’ve have definitely changed since having a baby, because in many ways you have to, but I also feel like I’m not quite sure who I am anymore. I’ve been waiting for things to click, for this natural shift to take place, but it’s not happening. I do know this isn’t just about having a child. My husband and I have recently realised we kind of messed up the whole ‘sleep training’ (or whatever) section of having a baby and are now paying for it with a bed sharing octopus baby, multiple wake ups, continued night feeds etc. And as a result of months of this we are truly exhausted, and sleep deprivation messes you up. My job is also one that comes with stress and responsibility, which add into the mix, and I’ve been hit hard with some kind of horrible winter bugs that have wiped me out a bit, so I’m in the middle of a perfect storm of low energy and self doubt. I don’t necessary want my ‘old self’ back, but I do need to figure out who I am now, and what I want, so I’m at least working towards something rather than just working all the time. My time management is such a big factor. I cram loads in to my time, but not effectively. I work four days a week, but only three in the office, and one is made up at home. On one hand this is great for me to have the flexibility to just work when I can each week, but on the other I just end up working almost every day or at least thinking about work, because I just look at what needs doing now and don’t plan ahead. This isn’t great, and also means I lose time for anything else… housework, hobbies (this blog suffers! ), Millie, the dog, my husband, or even just to relax and unwind a bit in the evenings. I want to write more. This blog has been a great outlet but I could do so much more with it. And there are book ideas in my head that have been festering for years, so I must get them out. And take dog walks because I want to, not because Pickle hasn’t been out yet today so I have to. And have proper conversations with my husband. And who knows what else. I know this isn’t just for now, and I can take the rest of my life if I want to. I just need to make sure I don’t fall off the bottom of the ‘to do’ list while I’m worrying about everything else. So there you go, a good reminder if you need one. 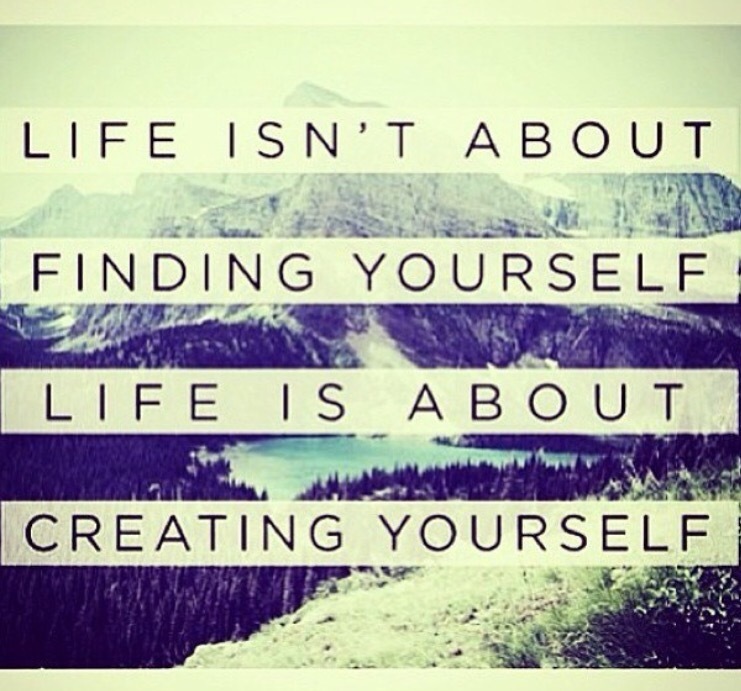 No one ever just found themselves, they created themselves along the way. I’m off now to try and pick up a few bricks and start stacking. From small acorns and all that!